DESCRIPTION: An aerosol dispensed fireblock grade polyurethane foam for filling gaps and cracks. Orange Tinted.DOW 24oz GREAT STUFF Pro Gaps & Cracks Foam (Gun) 341557 Great Stuff Pro 24oz. 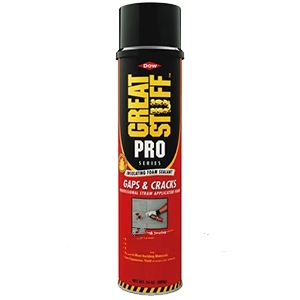 Gaps & Cracks Professional Applicator Foam Minimal expanding, single-component polyurethane foam sealant. Type V residential fireblock penetration sealant evaluated in ICC-ES Legacy Report No. NER-645. Fills, seals, and insulates gaps up to 3". Dispenses with foam applicator tool (not included, model No. 230409, Great Stuff applicator tool, (sold separately) for precise control. Energy savings eliminates unwanted airflow in winter and summer. Moisture-resistant skin prevents water penetration forming a durable, airtight, and waterproof bond. Quick cure time in less than 1 hour, tack-free in 6 minutes, and trims in 30 minutes. Foam sealant bonds to most building materials and can be painted or sanded. 1 can equals approximately 16 quart tubes of caulk. Linear yield at 3/8" bead is 970'. UL classified. Identifiable orange color. 24 oz. can. PACKAGING: Case of twelve 24 oz. aerosol cans (fits gun type dispensers). YIELD: 24 OZ. can yields about 970 lineal feet at 3/8" bead size. Dow #230409 PRO-14, 7-3/4 inch Barrel, Professional / Contractor-Grade Foam Dispensing Gun. Lightweight Aluminum Body. For use with Dow Great Stuff, Enerfoam and others. Includes Smooth Needle Nose Tip. Price/Gun.